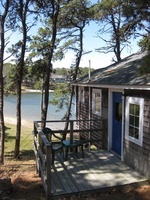 PILGRIM VILLAGE offers your family a chance to enjoy a vacation in an atmosphere of beauty and quaintness that you expect from a small fishing village on Cape Cod. 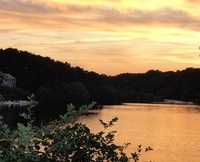 Here you vacation in a picturesque cottage nestled among the pines and along the shore of White Pond, a fresh-water pond of 40 acres ...formerly the town reservoir. PILGRIM VILLAGE gives you a chance to stroll through the pine grove, enjoy the fresh air, relax on acres of well-maintained and landscaped grounds, or sunbathe on the private beach. The beach at PILGRIM VILLAGE offers sand for children's play and safe, clean water for swimming for all ages. Located at the Beach are picnic tables and barbecues for outdoor cooking and picnics.